JANSSONIUS - Nova Zemla, Waygats, Fretum Nassovicum, et terra Samoiedum singula ómnium emendatissime descripta. JANSSONIUS, J. - Nova Zemla, Waygats, Fretum Nassovicum, et terra Samoiedum singula ómnium emendatissime descripta. Nova Zemla, Waygats, Fretum Nassovicum, et terra Samoiedum singula ómnium emendatissime descripta. - JANSSONIUS, J. Title : Nova Zemla, Waygats, Fretum Nassovicum, et terra Samoiedum singula ómnium emendatissime descripta.. Size : 15.7 x 19.7 inches. / 40.0 x 50.0 cm. Description :Shows Novaya Zemlya and northern continental coastline. Includes notes on 1594/95/96 discoveries. Illustrated with sailing ships, sea monsters, various people and animals of the region, as well as Barents's hut, where he and his crew survived the winter of 1596. Decorative cartouche and illustrated inset with projection diagram and two compass roses. 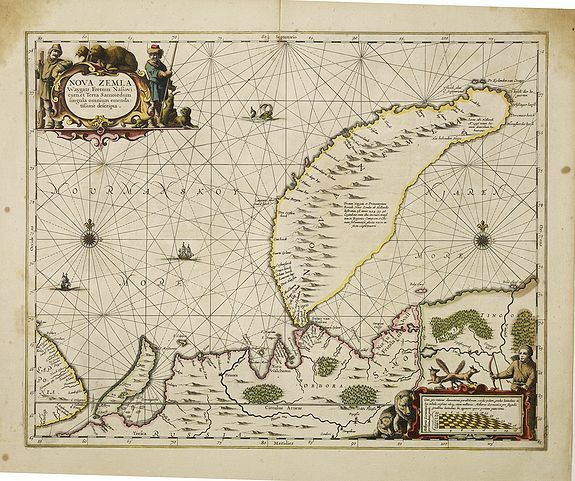 The Dutch were the most persistent searchers after the north-east Passage, whether to the north of Novaya Zemlya or through what they called Nassau Straits to its south. Decorated with two splendid cartouches, compass roses, two vessels and a sea monster. Condition : In very attractive original colours. Some light brown foxing in margins.